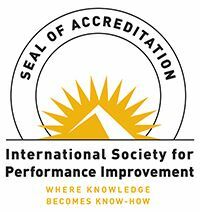 The Center for International Credentials, LLC (Center), offers this evidence-based certification for developers of learning solutions, in collaboration with and endorsed by the International Society for Performance Improvement (ISPI). 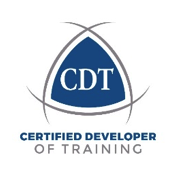 The CDT is also administered and awarded by the International Certifications Centre in Africa and the Middle East. Recipients are awarded the mark (CDT) and a digital badge unique to the learning solution used to demonstrate the standards, such as Instructor-led Training, Synchronous and Asynchronous eLearning, Serious Games, Self-study, and more. Collectively, the mark and badge are designed to promote certificants’ expertise. Certificants may or may not have been involved in the need’s assessment and front-end analysis, design, delivery, or post-course evaluation; however, they have demonstrated deep skills in developing learning solutions. The certification provides a measure of credibility in the field. It is both portfolio and evidence-based. It requires you to satisfy all 9 standards. In addition, certified IDs must show they have a professional brand or persona that they use to market their services internally or externally. Successful candidates will receive a mark, CDT and a digital badge. Digital badges may be used in social media, email, and websites. Your digital badge links to a site where your clients and employers can go to validate that you have a right to use that certification mark and to learn more about the badges’ requirements. Members: $750, Non-Members: $925 Click here to pay application fee. Not a member? Click here and join now for free! Not a paid member member? Click here and upgrade now!